Our vision is to enable the delivery of enriched, versatile, innovative and accessible learning experiences for the betterment of people, society and the world. EDGE was originally founded as EDGE Publishing in 2006, with the desire to improve student learning experience. We first published within the professional and occupational sector, later moving into the higher education space in 2009. 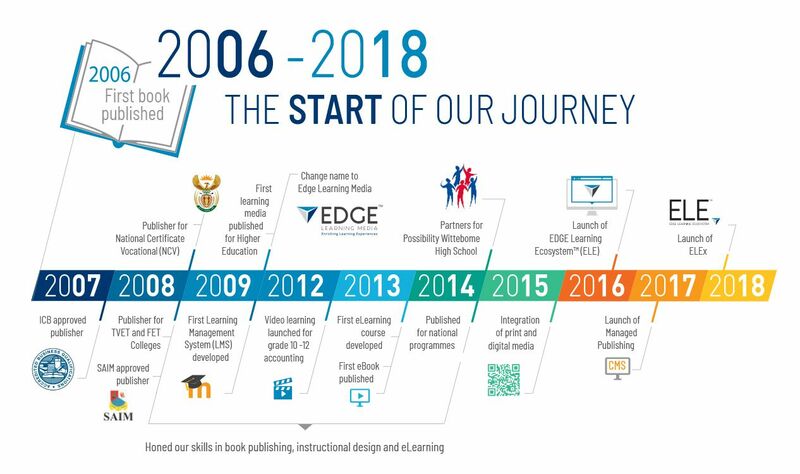 In the same year, we recognised the proliferation of digitised content in publishing and education, and changed our name to EDGE Learning Media. Over the next five years, we honed our skills in publishing, instructional design and eLearning. In 2014, we began to integrate print and multimedia. The EDGE Learning Ecosystem (ELE) was launched in 2016, with the purpose of delivering a multimedia-enriched digital learning experience. Today, we create and deliver both print and digital learning experiences, which are able to meet the diverse needs of our clients and their students.